If seeing starfish in their natural habitat is something on your bucket list, then you definitely are in the right place. 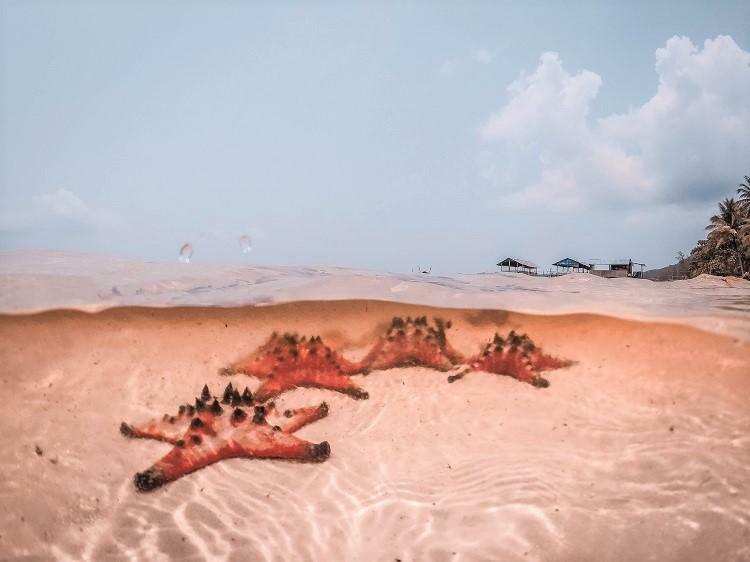 Phu Quoc Starfish Beach is the perfect place to observe these little creatures and admire their beauty. The beach has only been recently discovered but it instantly gained popularity among tourists because of the many red starfish that can be found here. The white sand and the palm trees add to the beauty of this place. It is important to remember that nature is not ours to play with. 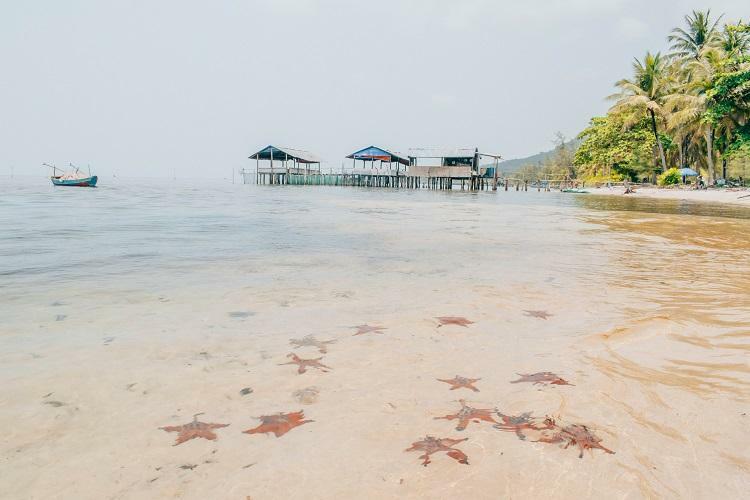 Phu Quoc Island Starfish Beach is an amazing place and it would be a shame if future generation won’t be able to enjoy its beauty. This is why, I recommend keeping in mind a few things before visiting it in order to avoid hurting the marine life. Also planning to visit Hoi An? Click here to read about the top attractions. You might be temped to take a swim in the clear water and there is nothing wrong with that. Just make sure that you are not stepping on starfish along the way. You might think that this is stupid but I have actually seen people removing starfish from the water and putting them in plastic bags as souvenirs. While I believe that some people are ignorant and are not aware that starfish are actually living creatures, it is our duty to stop this from happening. We can do this by informing these people about the effects of their actions. Click here to read more about one of the most unusual places in Vietnam. There has been much debate whether or not taking the starfish out of the water hurts them or not. The only thing I know for sure is that starfish are marine animals and this means that they are build for living in water. Taking them out of the water means that you are exposing them to an environment they were not built for. If you want to read more about how removing starfish from the water can damage them click here. Apart from admiring the starfish, there are a few activities you can do. Are you craving some seafood? You are definitely in the right place! Right on the Starfish Beach there is a floating restaurant with tasty food. There is nothing more romantic than taking a walk on this white sand beach at sunset while gazing at the orange sky. On our way to the beach, we got lost and we were lucky to discover this hidden gem. 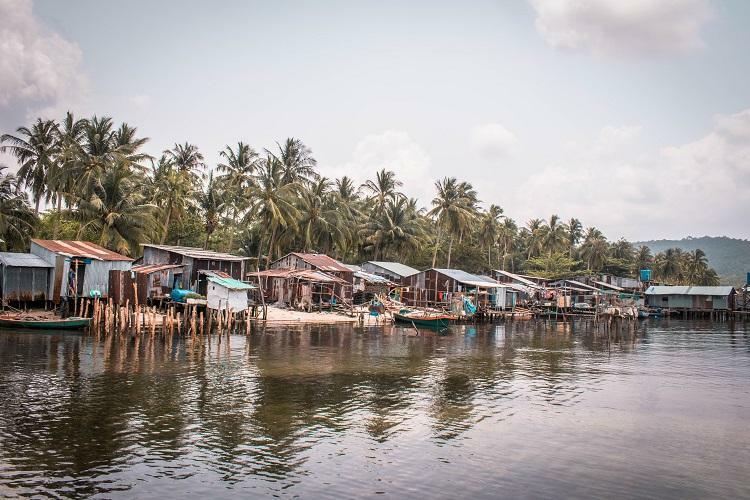 Right near the Phu Quoc Starfish Beach there is this beautiful village built on wooden stilts. It is definitely worth a visit. For the exact location clik here. If you are wondering where is the Starfish Beach, please check the map above for the exact location. The road is mostly good and easily accessible. There are many options to get to the Starfish Beach. Please find all the details below. Since the Starfish Beach started becoming more and more popular, there is one tour company which organizes tours. Please keep in mind that these tours are usually more expensive than going there by yourself. However, if you want a hustle free experience, then an organized tour is definitely the right choice for you. Alternatively, you can ask at your accommodation about other tour options. Click here for more details about the tour. Renting a car without a Vietnamese driver’s licence is not possible. However, you can hire a private taxi with a driver for one day. The price for this service starts at around $25 per day. Click here for more details. Exploring Phu Quoc Island by motorbike is the best option. It is cheap and convenient. You can rent a motorbike directly from your accommodation. 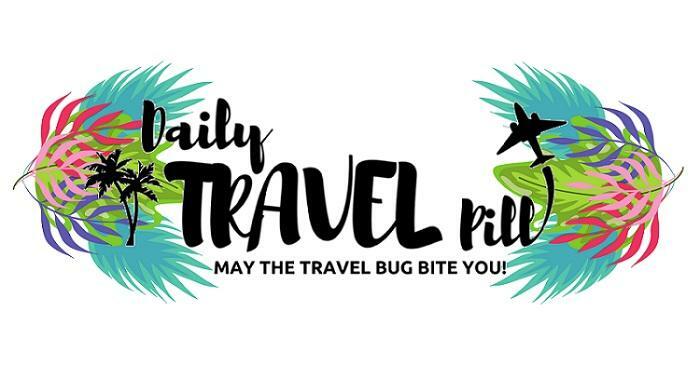 If not, try and ask at a few hotels or hostels and you will definitely find one to rent. The price per day for motorbike rental is about $10, depending on your negotiation skills. Please beware that driving a motorbike without a helmet is illegal. 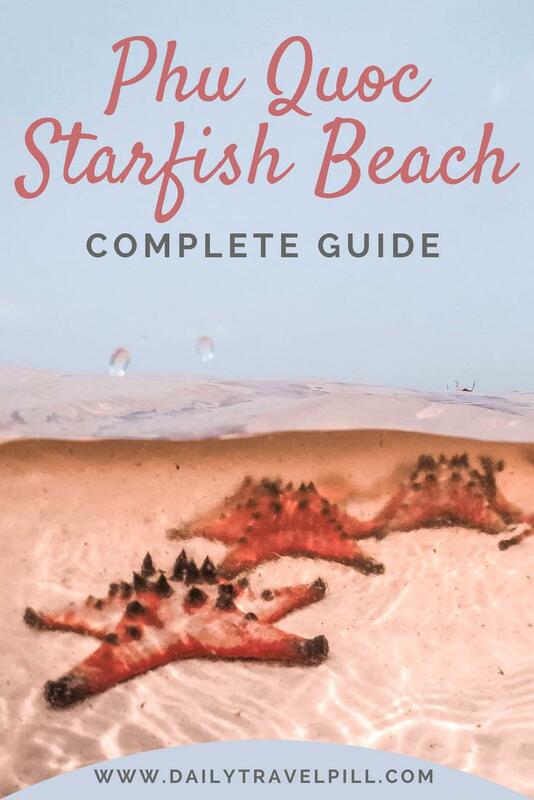 I hope that you have found this Phu Quoc Starfish Beach guide useful. Enjoy this beautiful place and don’t forget to respect the nature around you. The starfish are so pretty! thank you for reminding people not to step on them or take them! Looks like a beautiful place to go visit! I would love to add this to my list of places to visit in Asia! So magical. It is definitely worth visiting! And the good part is that Starfish Beach is not yet full of tourists. Woah I’m all about this starfish beach. That’s just so cool! A friend and I have unofficially decided to make a bucket list of all of the beaches with fun, yet strange animals, and I think this qualifies! So excited to visit one day. Haha! That’s so awesome! I would love to read that list! Wow what an amazing place to visit! Totally adding this to my bucket list! I am thinking to go this beach tomorrow but one friend told me that as is now rainy season maybe we won’t find starfish there. Anyone could confirm this? I wish I could help you but I haven’t visited the Starfish Beach during the rainy season. I’ve been there in april with my girlfriend and was amazing…sad part is that during the sunset hours you don’t realize that thousand of sand flies would eat you totally! On the next day we waked up with 120/150 bites all over the body despite repellent and without noticing any bite during previous night. Bites were so itchy abd laste 2-3 weeks so we had to take antistamimic and really a lot of aloe and cortisone cream…did someone got the same bad experience? Please share !! Wow! thanks so much for this message. I am sure that this information will be helpful for so many people! I didn’t visit this beach during the sunset. Therefore, the sand flies were not a problem. Thanks again for sharing!